The year 2013 provides an opportunity to see “The Number Thirteen” in a different light. revolution, or some kindred idea. God always speaks, even numbers reveal His design. What does this so-called “unlucky number” really mean? But a symbol of transition, moving toward perfection. For God removes blindness to reveal His perfect will. That each promise in the Word of God He will fulfill. To view the whole of life with newly enlightened eyes. That the Lord God is good and that His mercy endures. Abundant favor and boundless blessings I explore. Each a unique savory foretaste of eternity. The strength to lead and faith to follow the Lord each day. Me in peace by the strength of His right hand, as I pray. Unspeakable joy floods my soul, as glory unfolds. So gracious and kind, the Lord of the endless lagniappe. 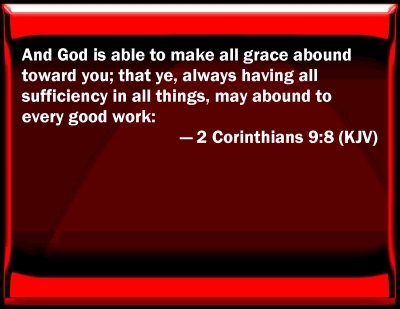 May this New Year of 2013 overflow with the goodness of God, “The Lord of the Endless Lagniappe, ” for He alone is able to make all grace abound toward us that we always, having all sufficiency in all things may abound to every good work.